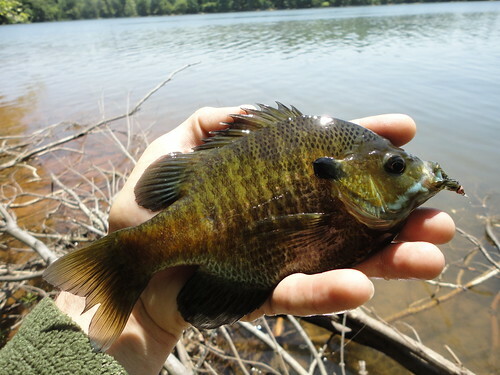 There are many warm water fishing options in Central Maryland during the Summer months. Anglers can fish large reservoirs, ponds, rivers and even small streams across the state. Once June arrives I start to spend a day or two a week exploring numerous warm water hotspots. I went over to Loch Raven Reservoir last week armed with my 1 weight Scott fiber glass rod. I quickly located a fallen tree swarming with crappies. My camera was dead, so it was just an hour of catching and releasing a few dozen “paper mouths.” A few days later I returned to the area to find the fish were either pulled out, or they moved into deeper water. A long hike into a remote area lead to a fallen tree loaded with good sized blue gills. The small rod got quite a workout, and the fish were taking damsel fly nymphs. The casts were short, but stripping the fly amongst the submerged branches was the hard part. There was a few large mouth between 2-4 pounds cruising the shallows, but I never bothered to cast to them with such a small rod. The next day I targeted carp in a wide river, where the big fish cruise the shallows. 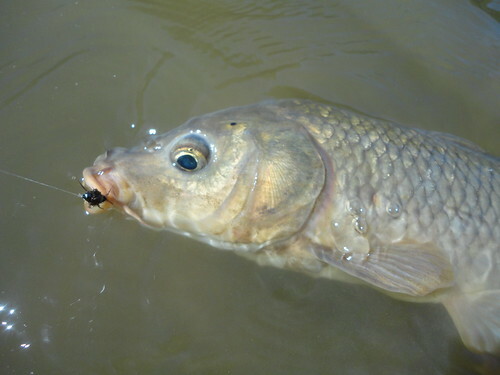 The water was very stained after recent rains, so it was really tough to get the carp to notice the fly. I hooked six fish, broke one off, landed two and lost the others on the take. The Summer ahead should provide many good days chasing these often wary, but big fish. A few days ago I decided to try an interesting small stream I never fished. I marked this stream on my car’s GPS last year while running errands. I hoped to find wild browns in the small creek. I walked down to the first pool and rigged up a small bugger on the one weight. The water was clear and dark shapes holding on the bottom moved slightly. I made a cast and immediately coaxed a fish to rise off the bottom. The fish slammed the fly. I was surprised by the fight, and also to reel in a chunky eleven inch smallmouth. I moved to higher ground to get a better view of the pool. A dozen smallmouth, between ten and seventeen inches, shared the deep pool with sunfish and suckers. A quick switch to my Scott G2 9 foot 4 weight, and I returned to the pool better prepared. I hooked the two biggest bass in the pool, but only landed a few ten to twelve inch bass. The rest of the day was spent stalking the shallow pools, spotting fish and exploring new water. I even filmed while fishing, and managed to get a few aggressive takes on camera. A large white Zonker on 4X was the only fly I fished the whole day. The section held a lot of bass and my tally neared twenty bass landed, and many others spooked or missed. I landed a few 14-15 inch bass, and only a couple under ten inches. A few larger small mouth bass pushing three to four pounds are sure to require a return trip. The latest video post features a mash up of three different warm water outings. This entry was posted in fishing report, video on June 9, 2011 by Jason du Pont.